Do you need a Reference Letter Requested by the Employer? We provide a well-crafted Reference Letter template that suits your needs! The way you present yourself is important and should always get your utmost attention. Communicating in a professional manner will get you respect and will bring you and your company further in life and business. By using our Reference Letter, Request by Employer , you will take a head start, which is giving you more time to focus on what really matters! We support you by providing this Reference Letter, Request by Employer template and you will see you will save time and increase your effectiveness, inspiration and increase your chance to finish the job successfully. 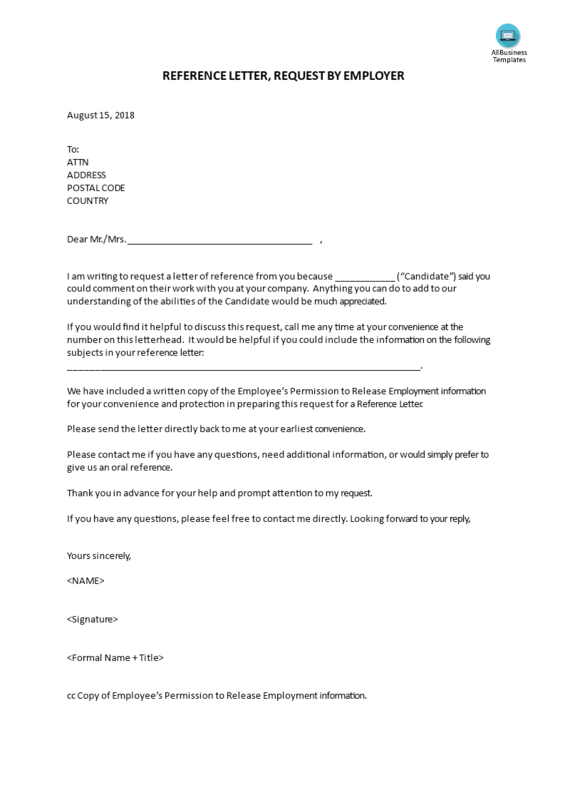 Download this professional Reference Letter, Request by Employer template now! For more business templates? Just browse through our database and website! You will have instant access to thousands of free and premium business templates, legal agreements, documents, forms, letters, reports, plans, resumes, etc., which are all used by professionals in your industry. All business templates are ready-made, easy to find, wisely structured and intuitive.